"Lemuria is the name of a hypothetical "lost land" variously located in the Indian and Pacific Oceans. 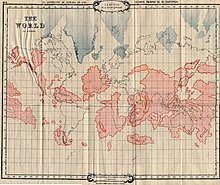 The concept's 19th-century origins lie in attempts to account for discontinuities in biogeography; however, the concept of Lemuria has been rendered obsolete by modern theories of plate tectonics. Although sunken continents do exist – like Zealandia in the Pacific as well as Mauritia and the Kerguelen Plateau in the Indian Ocean – there is no known geological formation under the Indian or Pacific Oceans that corresponds to the hypothetical Lemuria."